© Forward Computing and Control Pty. Ltd. NSW Australia, All rights reserved. The java application available here, will generate essentially 'random' 128 bit keys, encode as hex digits, for use with SipHash Secure Challenge and Response for micro-devices (AVR / Arduino). The application also has the option to save the key's hex digits in a QRcoded image. 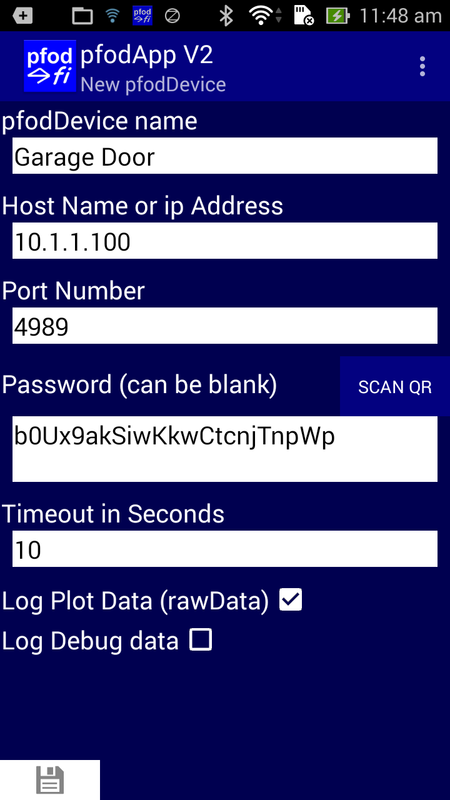 This simplifies loading this long key into the pfodApp on your Android mobile. To run the application, download the jar file, SecretKeyGenerator1_0_3.jar. Save it in a directory which you can write to. Put the downloaded SecretKeyGenerator1_0_3.jar file in a directory. If the above window does not appear, goto www.java.com and download and install Java. As mentioned in SipHash Secure Challenge and Response for micro-devices (AVR / Arduino), in order to be secure, the key must be long and un-guessable. The 128 bit keys generated by SecretKeyGenerator1_0_3.jar, are generally believed to resistant to brute force attacks, which try all possible combinations of the secret key. The other means of attack is to guess the key based on some other knowledge. This Key Generator, produces an essentially 'random' key, which means one key is a likely as another as far as both you and any attacker can tell. 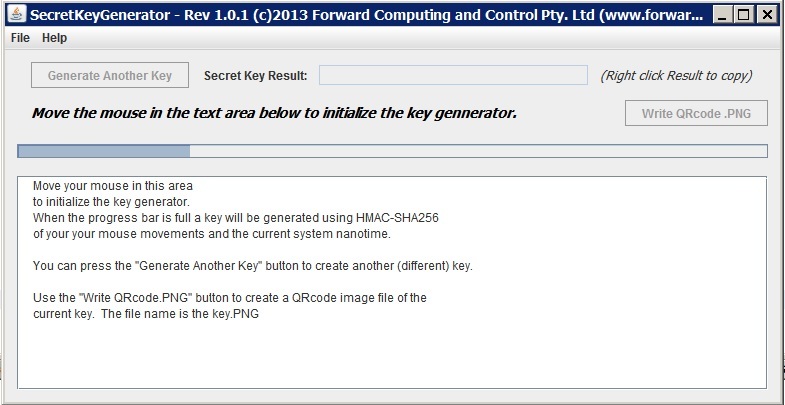 To initialize the key generator, you move your mouse around in the text window. When the progress bar if full a key is generated from your mouse movements and the computer's current nano time. The generated key is the first 16 bytes of the resulting hash. When you press the Generate Another Key button, a completely new key is generated from your mouse movements and the computer's current nano time. The key produced is essentially unique and un-reproducible, because even with the exact mouse movements, the nanoSec time will be different next time. Each press of the Generate Another Key button produces a different key. To simplify entering the generated key into the Android pfodApp, the SecretKeyGenerator, also allows you to save the key as a QRcode image. The .PNG image will have a file name of the key it contains. Attaching this image to the device protected by this key, allows users to scan the QRcode directly into the pfodApp's connection password field using the Scan QR button.